Baby chimpanzee, under the care of Liberia Chimpanzee Rescue. 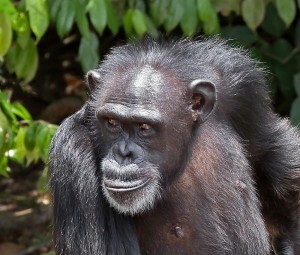 Chimpanzee recovering from years of testing and trauma. The Liberia Chimpanzee Rescue, near Charlesville, Liberia, is improving the quality of life for more that 60 chimpanzees abandoned by New York Blood Center after nearly 30 years of invasive research and testing. 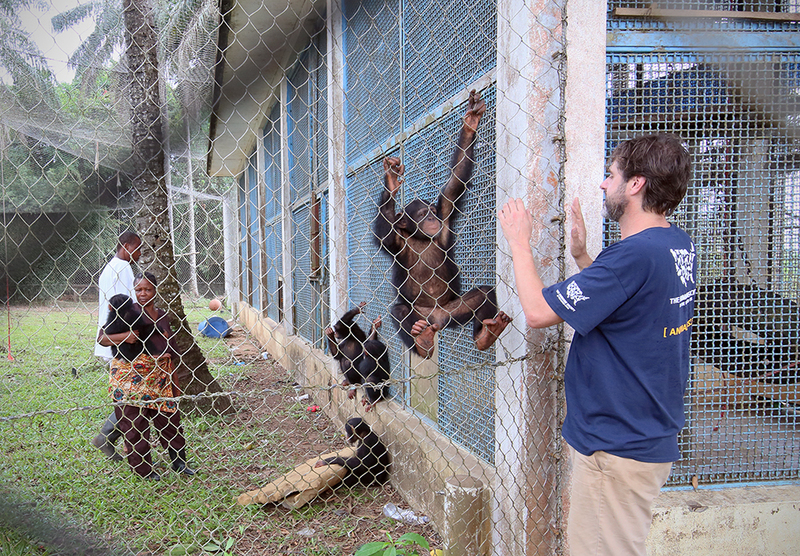 The Humane Society of the United States, together with Humane Society International, are working closely with the government of Liberia and other organizations to provide care for the traumatized chimpanzees after they were abandoned. Many of these chimpanzees were born at the original research center, which operated for 30 years from the present location of today’s Liberia Chimpanzee Rescue compound. 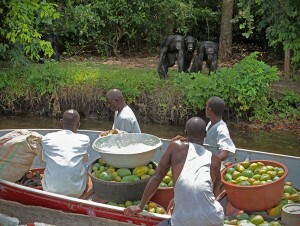 A team from Liberia Chimpanzee Rescue prepares to feed chimpanzees on one of several islands. 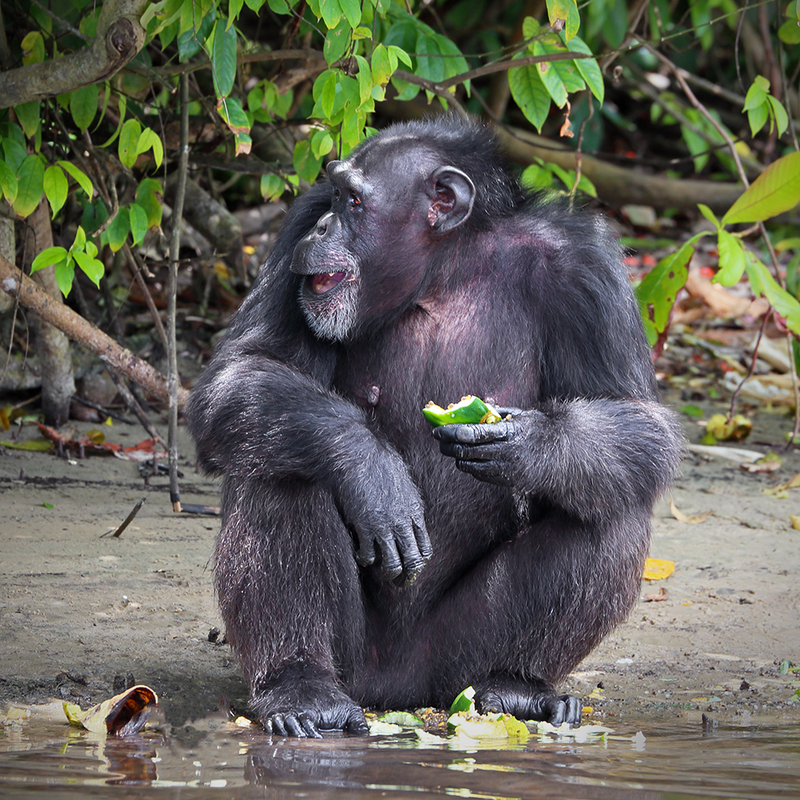 The chimpanzees are living out their remaining years on several islands along an expanse of rivers and lagoons near the Atlantic coast south of Monrovia. Chimpanzees cannot swim, which allows their confinement on the islands to be cage-free. The islands are not large enough to support the chimpanzees without providing additional food and fresh water, therefore, a team from Liberia Chimpanzee Rescue collects food from farmers and organizations throughout Liberia. These foods, some donated and others purchased, include bananas, pineapples, papayas, riceballs, greens and other locally-grown fruits and vegetables. This diet is prepared and distributed to the chimpanzees on a daily basis. Their menu is balanced and managed by Jim Desmond, the veterinarian leading the rescue effort. Included in their diet are contraceptives, in the hope of managing this population without adding additional burden to the limited resources. Jim Desmond and team work with orphaned baby chimpanzees confiscated by Liberia’s Forest Development Authority. 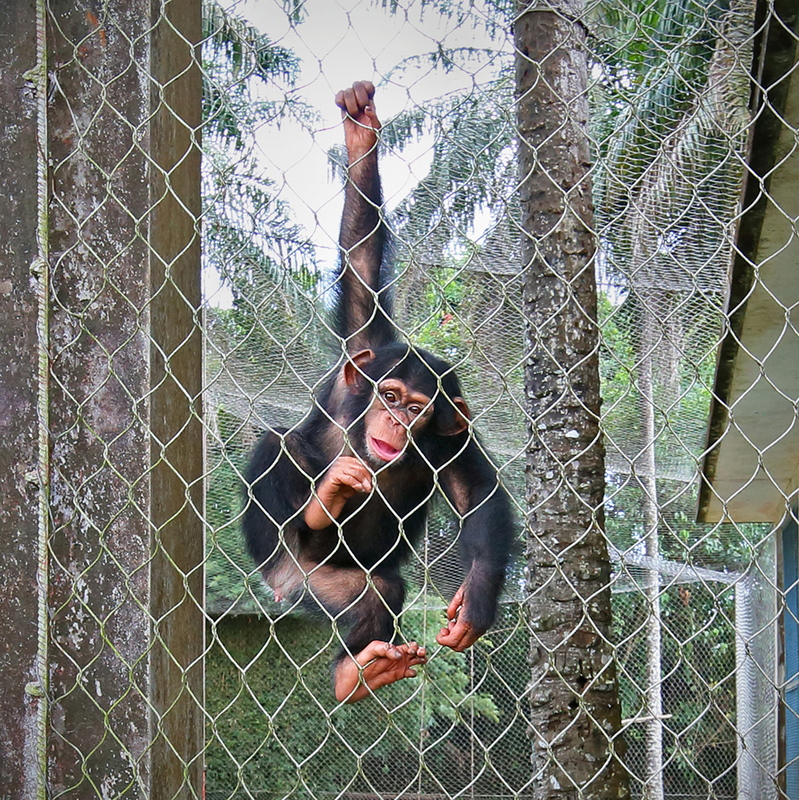 The Liberia Chimpanzee Rescue also provides sanctuary for infant chimpanzees orphaned by the bush-meat trade. 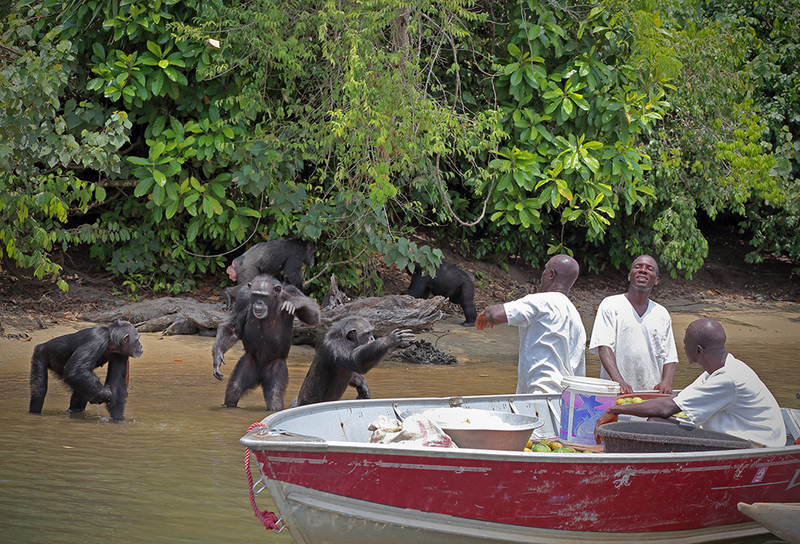 Approximately 7000 wild chimpanzees live in the forests throughout Liberia. The chimpanzee mothers and family members were likely killed (illegally, as they are a protected species) to supply bush-meat markets. The infants, most too small to butcher, are often funneled into exotic pet-trade markets. In light of their dire circumstances, the few fortunate enough to be confiscated by Liberia’s Forest Development Authority have been brought to the Liberia Chimpanzee Rescue, where they are being integrated into a sanctuary family. Jenny Desmond is the constant caregiver for the frightened, often dehydrated and starving infant chimpanzees brought to Liberia Chimpanzee Rescue. Eventually, they are introduced to their new sanctuary family. There is hope that perhaps one day in the future, chimpanzees rescued from the bushmeat and exotic pet-trade will have a chance to be reintroduced back into their natural habitat. This entry was posted in Liberia and tagged Africa, chimp, chimpanzee, Liberia, Liberia_Chimpanzee_Rescue. Bookmark the permalink. Thanks for the great blog David and for a wonderful visit. Lovely to meet you and look forward to seeing you, and Lisa, soon! Greatly appreciate your interest! Cheers, Jenny. thanks Jenny. I am impressed to see all of the hard work you and Jim are doing, along with the rest of your team. Hope to be back soon.